Bump for today's film. Starting my DVD now. 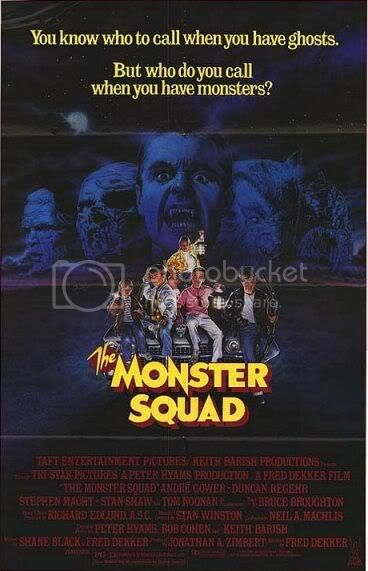 Monster Squad > The Goonies. In fact, I think The Goonies is one of the most overrated films of all-time. I challenge an adult to see it for the first time and like it. Bunch of whiny kids that I kept hoping would get killed. I'm convinced the only people who like it saw it as kids and are blinded by nostalgia. It's subject matter should be right up my alley, but it is painful to watch. Pinchers of power on both you guy's jugulars! But anyway, Monster Squad is still one of the coolest monster ensemble films. Stan Winston's creatures are still great, although Dracula seems a little too Munsters than monsters. Time has made the movie seem overly politically incorrect, but the kids in the film are no different than kids today, it's just that film today filters the kid out of the kid to maximize the audience and their $10 bills. I would love to frame by frame the treehouse scenes to try and find all the movie references. This film is to horror in the way Last Action Hero is to action, it just plays up the mythos while paying its respects to it's genre's lineage. Fairly fun film is sort of like The Goonies crossed with Abbott and Costello Meet Frankenstein. It's enjoyable, but it's certainly not as good as I had hoped it would be. I don't know why I don't like it more, but the complete lack of depth to the characters may be one reason. I really like how the Wolfman reassembles himself after he's been blown up, however. It's an okay Saturday afternoon kind of film. Wow, I feel enlightened now with these comments putting Goonies in persective. I've never been able to put my finger on it 'till now. This movie is everything that one wanted to be. Bump as i finally got this on bluray and watched it again for first time in 20+ years (ackk). Sure it's dated but I love it (and agree it's better than the annoying Goonies). Forgot how awesome Stan Winston's monster designs are. It's interesting that the plucky gang of outcast kid/kids fight evil genre seems dead now - other than Super 8 which was a homage, are movies like this in tone, Goonies, Stand By Me, War Games, ET, Last Starfighter etc made anymore? Or maybe they are and I'm 41 now and out of the demographic. You aren't missing anything, that period of time when kids became popular protagonists in horror is largely gone today. I would say the '80s were the zenith of that theme. I like this movie, it's a great bag of fun for fans of older horror films. Though I think it's sacrilegious comparing this film to The Goonies. That movie is the quintessential kids' adventure pic.